SELF-ish at the Vancouver Fringe Festival! What has Assaulted Fish been up to lately? Glad you asked! 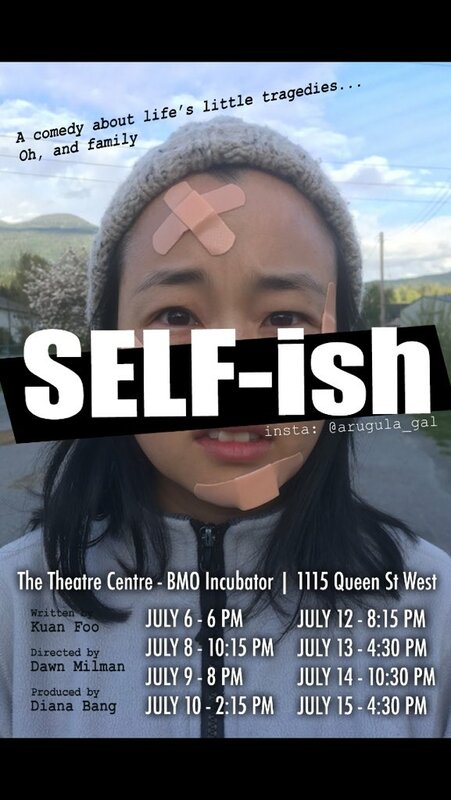 After slowly creeping her way across Canada, Assaulted Fish’s Diana Bang finally brings her critically acclaimed one-woman show SELF-ish home to Vancouver as part of the Vancouver Fringe Festival. Written by fellow Fish, Kuan Foo and directed by Fish-alum Dawn Milman, SELF-ish tells the story of Esther Jin, a 30-something Korean-Canadian navigating her relationship with her family in the aftermath of a recent tragedy. It’s a bit funny, it’s a bit sad – sort of like life. “Movement is important here, as are expressions, because they help carry the emotional range and complexity of Esther’s story and character. Bang’s performance is dynamic and delivered everything that this part demanded. General admission seating. No latecomers. Rated 14+ (coarse language). Click here for show times and to purchase tickets. Tonight and tomorrow are the last two chances to the see the debut of “Self-ish” at the Toronto Fringe Festival. Starring Diana Bang and written by Kuan Foo (both of Assaulted Fish Sketch Comedy) and directed by Dawn Milman (Assaulted Fish Alumnus director). If you are in Toronto be sure to catch Diana debuting her solo show “Self-ish” at the Toronto Fringe Festival. Written by Kuan and directed by Fish alumni director Dawn Milman, Self-ish tells the story of Esther Jin, a 30-something Korean-Canadian, navigating her relationship with her family in the aftermath of a recent tragedy. It’s funny too! Honest! Here are some opening night reviews! Seven shows left! Don’t miss out! Rated 14A, for coarse language and violence against cardboard boxes.